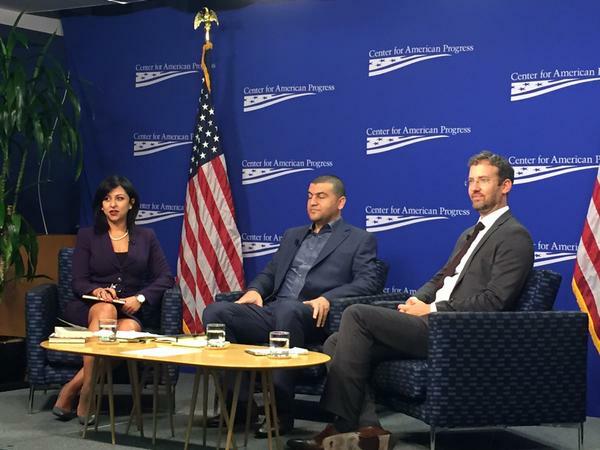 On Friday, October 16, 2015, the Tahrir Institute for Middle East Policy (TIMEP) and the Center for American Progress co-hosted an event entitled “Understanding ISIS”. Speaker Hassan Hassan, Non-Resident Fellow at TIMEP and author of the New York Times bestseller ISIS: Inside the Army of Terror, shared the stage with Brookings Fellow and Project Director William McCants, author of The ISIS Apocalypse: The History, Strategy, and Doomsday Vision of the Islamic State. TIMEP’s Executive Director, Dr. Nancy Okail, served as the moderator for the exchange. The event opened with an insightful discussion on the Islamic State’s entrenchment and expansionist doctrine, with McCants commenting that “[ISIS’s] successes in Syria and Iraq has provided a model for other extremists for insurgency and expansion.” In drawing tribes into its influence and forming a state-like entity, Hassan added, the Islamic State has been “more successful than previous regimes.” The speakers went on to discuss a number of timely issues, including ISIS’s effectiveness in resolving social disputes, its influence on disaffected youth, and the nature of fighters’ fluid affinities, among other issues. The discussion was followed by a lively question and answer session, during which the audience pressed panelists on appropriate policy recommendations, the nature of the organization’s funding, violence, and recruitment schemes, and the role of women.